I am calling this a mahogany Cornish hen. Because I drizzled it with honey before baking, it came out a little darker than I would have liked. But there is no denying the excellent flavor. I did not roast a turkey this year. We spent Thanksgiving at our friends’ home and my only contribution was a butternut squash casserole. We missed our family but it was interesting to view another familiy’s rituals, which to be quite honest, were so much like our own. Generations, from the revered older uncle to the youngest one year old tripping over doorway steps and trying to pull knives out of the open dishwasher, were all present and accounted for. The turkey, mashed potatoes and dressing, not to mention the crockpot full of gravy were all just right. On that one day in November we are all the same. Thank you Stephanie and Bruce for a great day. So on Friday, because I was not preoccupied with shopping, I decided I would make Cornish hens to feel a part of the Thanksgiving weekend. Black Friday shopping is not for me, but we actually did venture out to a big box store to take advantage of the sale on appliances. We ordered a new stainless steel gas stove and refrigerator. They will be delivered on December 10th. In the meantime, we have to get a propane tank and a gas line into the house. I love my gas stove in Lake Lure and look forward to replacing the electric stove here. The Cornish hens were an experiment. I received my package of O OLIVE OIL’S blood orange olive oil and porto vinegar and have been enjoying the flavors. I will be posting my contest entry recipe on December 1st. I am one of 8 contestants in the eRecipeCards cookoff. We will be judged on our recipe, our writing style and our photography. I would appreciate your vote on December 1st. But back to the Cornish hens. 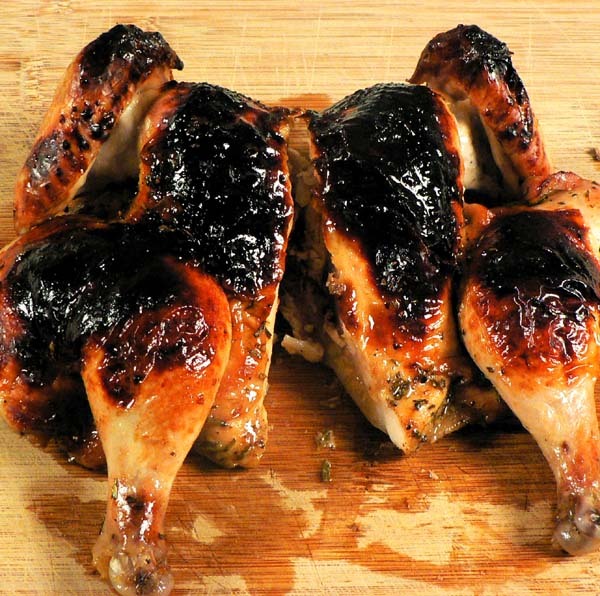 The recipe was simply a matter of drizzling spatchcocked Cornish hens with honey, olive oil and balsamic style vinegar. They were seasoned with chopped rosemary and salt and pepper and baked in a 400 degree F. oven until done. My only advice is to have a very sharp knife to remove the backbones and press down hard on the breasts to flatten the birds. I will see you back here on Thursday. 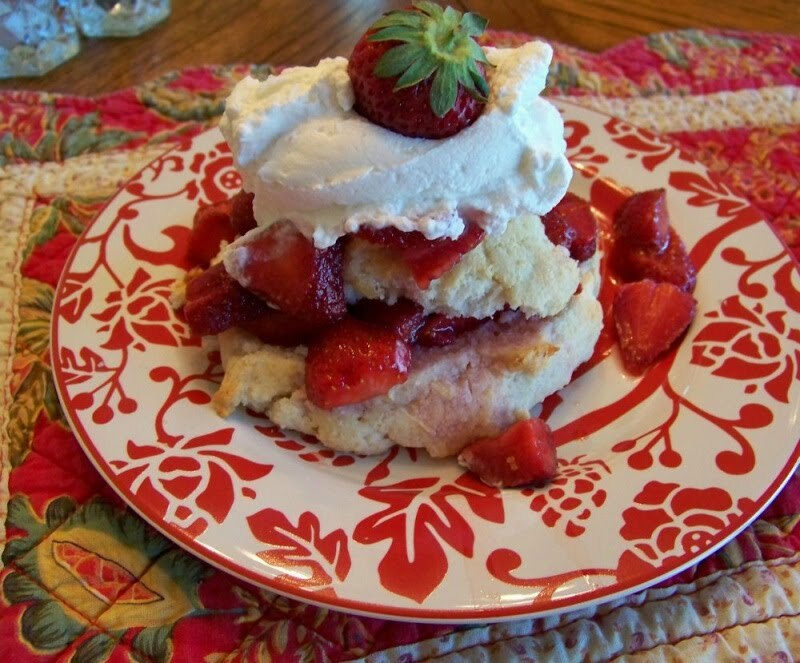 I have given my entry recipe much thought and hope it is a winner. It showcases the citrusy flavors of the olive oil and the smoky nuances of the port vinegar. Now if I just had a new camera . . . . early Christmas present maybe? Posted on November 26, 2011 at 10:34 am. Blogging has many benefits. Among them is meeting other bloggers. Add to that meeting other bloggers and being asked to dinner. Last summer I met fellow blogger Penny of Comforts of Home and Lavender Hill Studio. You can read about our get together here. Not only do we share a name, but we are both from Michigan originally and now live very close to each other. Penny and her husband live in Asheville and have been working on remodeling their new home. I have been following her progress on her blog and was so excited when she emailed and invited my husband and me to dinner. Her house is even more beautiful in person. She is a very talented decorator and her home is warm and welcoming. She is also an excellent cook. Our dinner was Cornish Hens with Pancetta, fresh asparagus, and roasted baby new potatoes. The cornish hens were absolutely delicious and the presentation was stunning. They were stuffed under the skin with mascarpone cheese and pancetta was draped over the top. They were succulent and flavorful. My picture below does not do them justice. Here’s the thing about being a blogger. There are no etiquette rules for our obsession with snapping pictures of food. I usually have to take several pictures to get just the right angle and lighting. It just didn’t seem right to be standing in Penny’s dining room, shooting picture after picture while everyone was waiting to eat. So I shot just one. It will have to do. The other two pictures are courtesy of Penny. She is a blogger. She understands. Isn’t that a beautiful plate of food. We had a wonderful time with Penny and Mr. Comforts of Home. We discovered that we have much more than blogging in common and our husbands had a lot to talk about too. We will be entertaining them at Lake Lure soon. Thank you Penny for a wonderful time and for sharing your recipe. Season the inside of the hens with salt and pepper, then place 2 pieces of garlic inside each one. Lift up the breast skin and spread one tablespoon mascarpone over each breast under the skin. Sprinkle each breast with one teaspoon chopped oregano and pepper to taste. 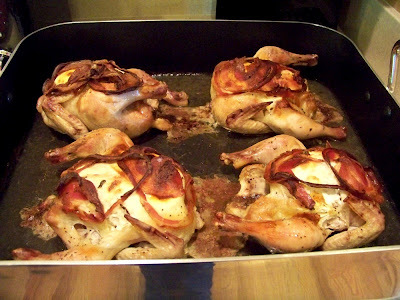 Place the hens in a roasting pan and place two pieces of pancetta slices on top of each bird. Roast in a preheated 400 degree oven for one hour to one hour and 15 minutes or until juices run clear when the flesh is pierced in the thickest part. Remove from oven, sprinkle with remaining fresh oregano and let set 10 minutes before serving. We had strawberry shortcake with local South Carolina strawberries for dessert. You can’t get much better than that. I love Penny’s plates too. Posted on May 11, 2010 at 4:37 am.